As wind gusts reached up to 51 miles per hour throughout the Valley, first responders were flooded with calls to service. FRESNO, Calif. (KFSN) -- As wind gusts reached up to 51 miles per hour throughout the Valley, first responders were flooded with calls for service. "Everything from power lines being down, which is the majority, several water leaks, traffic accidents out west which has a lot of trees," said Randy Reitz with Fresno Fire. Within a 90 minute window starting at 4:30 p.m., Fresno fire crews responded to approximately 100 calls, like a light pole that smashed a Mercedes on Palm and Barstow. "Our units have been extremely busy we've actually reached out to Fresno Police to get officers to assist us," Reitz said. In Central Fresno, fire and PG&E crews spent several hours at Leavenworth Elementary. A large pine tree sheered a natural gas line and water main as it toppled over onto the school. PG&E spokesman Denny Boyles says thousands were impacted in Fresno and Madera counties, with the number of customers affected varying throughout the day. "When its that many separate outages it's going to take time to restore everyone," he said. PG&E has been monitoring the potential impact of this storm for the last week, making extra crews available for this storm system. "Wind is unique, (with) the ability to rip off a tree branch and throw it into a power line. We'll see a lot of downed power lines in a wind storm then we will I other types of weather," Boyles said. 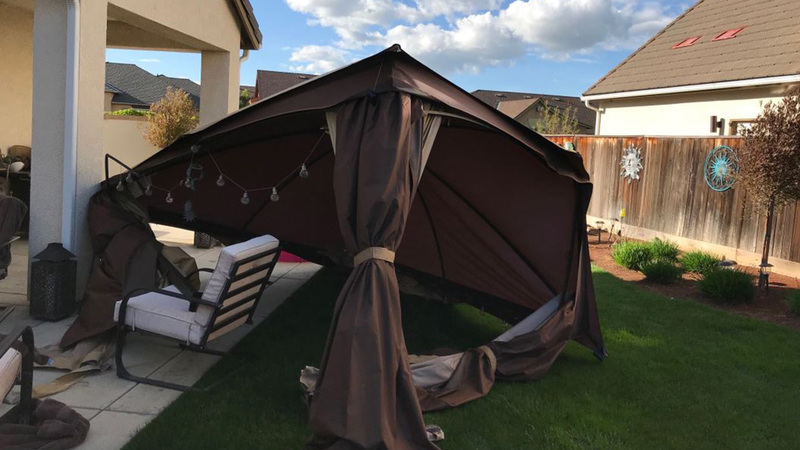 Strong winds caused a pop-up gazebo to fly 20 feet off a cement pad and into a patio covering in Harlon Ranch in Clovis. In Fowler, ABC30 insider Yvonne Hernandez captured pictures of two trees uprooted by high winds, closing Panzac Park for the afternoon. At Lavona Road and Bullard just outside of Clovis, high winds proved dangerous for Cal Fire crews responding to downed power lines and a vegetation fire. No one was injured in the fire, but the damage remains.